The Kierland Commons area is located in the Scottsdale Road resort corridor of northeast Phoenix, and the sought after "85254" zip code. 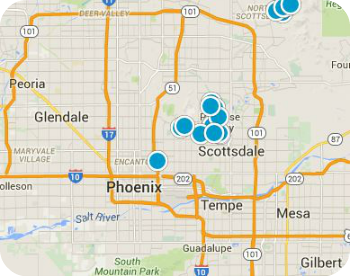 The 85254 Zip Code is one of the largest zip codes in the Metro Phoenix Market. It consists of almost 14 square miles, and over 20,000 beautiful single-family homes, condominiums, and town homes, so there is truly a home for everyone here. This community offers dramatic views of the surrounding McDowell Mountains and Pinnacle Peak. A three-mile hike-and-bike trail links residential neighborhoods, schools, retail, and recreation within the development, on either side of Greenway Parkway. 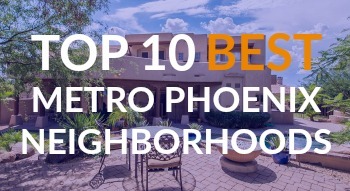 There are more than nine community parks, an equestrian park/center (Sereno Park), and more than 10 golf courses within a 10 minute drive of the Kierland area. The Kierland area is home to some of this city's premier shopping, dining, and entertaining. There are endless high-end restaurants and elite shopping centers within walking and biking distance of the Kierland communities. In the heart of the Kierland area lies the Kierland Commons, known for its' incredible shopping, dining, and arts/entertainment. Just east of Kierland Commons lies the beautiful Scottsdale Quarter, full of its' own elite level of shopping, dining, and entertainment. The Kierland area also only lies a short 5 minute drive from the Desert Ridge area as well... so there is never a shortage of things to do in this area. Kierland lies within both the Paradise Valley Unified School District and the Scottsdale Unified School District so families have access to some of the finest and most sought after schools in the Valley of the Sun. Buying or selling a home in Scottsdale's Kierland Commons neighborhood? We have the complete MLS inventory of Kierland Commons homes for sale. Sign up for new listing alerts and be the first to see the latest Kierland Commons homes as soon as the hit the market.